What releases tension, shifts energy and mood, balances your hormones and feels oh, so good? A good belly laugh! Now there are all forms of laughter therapy such as laughter yoga, laugh tracks, simulated laughter, and all forms of humor from clowns to videos. Norman Cousins in Anatomy of an Illness cured his illness and Patch Adams brought health and healing to his patients through humor. There are hundreds of studies that looked at humor and laughter in relation to health in everything from cancer, people awaiting transplants, depressed or anxious mood, and intensive care. How it is dosed and perceived may differ, however the benefits are vast and the side effects scarce. 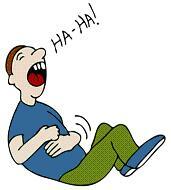 Laughter lowers the stress hormone cortisol and increases endorphins the feel good neurotransmitters that dull pain. Introducing the joy of play and laughter into high-stress, high-demand work environments can increase creativity, productivity and motivation, as well as improve communication and boost morale, say several experts on humor in the workplace. So bring your sense of humor to your workplace, engage people who are ill, depressed or anxious or when you are feeling down. Simulating laughter may have the same benefits as spontaneous laughter so fake it until you make it.